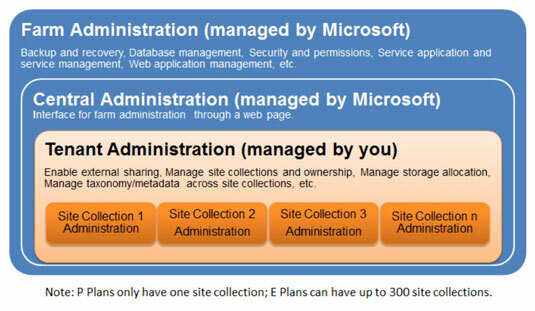 In a multitenancy environment, a SharePoint farm is architected in such a way that it serves the needs of multiple client organizations. This means that the farm is sliced into subsets and deployed individually for clients and tenants who then manage their own tenancy. As a business owner, this model gives you the ability to run your business the way you want to and leave the IT-related tasks to Microsoft. For example, as a tenant, you have full control to manage how your content, product, service, marketing collateral, and anything else that you want to manage on the Tenant Administration level, are categorized or classified. In SharePoint-speak, this process defines your taxonomy. Defining your taxonomy upfront establishes naming standards to achieve consistency and content discoverability. After you enter your taxonomy in the Term Store, tagging content becomes easy and intuitive. For example, if you’re tagging a content from a SharePoint site and you type in the letters pro, terms listed in your taxonomy starting with pro (for example, program, project, prospect, and so on) appear, giving you the ability to select the one that fits your needs. The great thing about this is that all the site collections under your tenancy can now consume company-approved, corporate-driven keywords from your taxonomy. This doesn’t mean, however, that tagging is limited to the keywords in your taxonomy. Users can always add new tags, which the admin can then add to the Term Store, if appropriate. In a multitenancy environment, each tenant is separated from all the other tenants with secure “walls” so that one tenant cannot access another tenant’s assets. Therefore, if you do a keyword search from any of your site collections, the search results will only pull data from within your tenancy. For this reason, FAST Search, Microsoft’s enterprise search product that uses deep linguistics and text analytics technology to add tags to content, is not included in SharePoint Online. FAST Search is not multitenant aware, so if you do a search with FAST, FAST goes up to the farm level and returns results from other tenants or companies on the same farm.